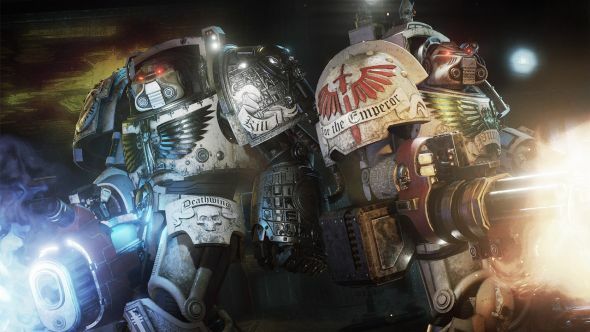 Space Hulk: Deathwing has a new gameplay trailer to coincide with its launch on PC and PS4 today. It’s pretty impressive stuff, with a cinematic opening from the perspective of one of the Dark Angels. He does a lot of proto-religious ranting about the Imperium of Man, but also smashes up some horrible space monsters, which is pretty cool. The trailer, which you can watch below, shows off the game’s campaign, which is available to for you to play in both solo and co-op. There’s also full customisation, allowing you to make your Dark Angels significantly more colourful than I would assume Games Workshop ever intended them to be. If you’re not fussed about colorful gear though, you can also customise your weapons for both online and solo play. Here are some of the best co-op games on PC. On top of all of that, there’s a brand new class, the Chaplain, new weapons and powers, and new enemies to use them all against. There’s even a new game mode, special missions, which offer randomised encounters and enemies in all of the game’s campaign environments.. All of it is completely free for previous owners of the Enhanced Edition on PC. If you want to pick up the new edition, you can currently get a 20% discount on Steam, where it’s available for £27.99.